Love is in the air this CHA season at Karen Foster. Below are some layouts I did using the new "Love" line that will be debuting at CHA next week. But before you take a peak at my work we need to get to the best part of the sneak peaks - the giveaway - you can enter today's drawing for a set of LOVE themed products by going to Wendy Inman's blog and leaving a comment before 11:59pm MST on Sunday, Jan 18. 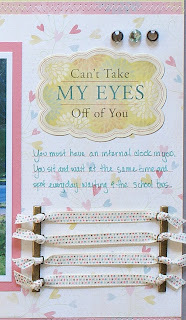 Here I used some new Loopy Bradlines and some of the new Love Timmings Ribbon (btw...I am in love with this ribbon). The stickers are wondorful and have a lot of nice images and sayings. As you can see below I did not even have to so a traditional LOVE layout with the Love line of products. Here is a close up of the stickers, bradlines, and sparkle brads. 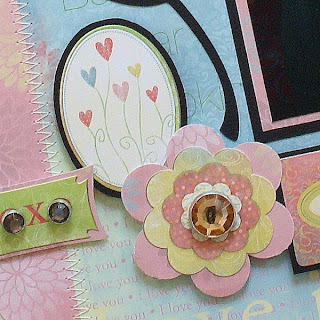 I used more sparkle brads on this layout and layered the flower stickers for a 3 dimensional effect. Close up of some stitching, and some of the stickers that I backed with black cardstock to make them pop! Pop dots for dimension and some sparkle brads for some bling. This layout was fun also. Gosh, I just love this paper. The cream with heart flower bunches is just so sweet. 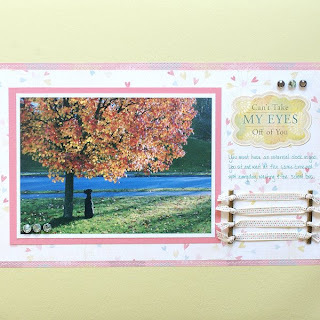 I could see lots of spring and easter pages done with this. Also, pair it up with the Baby Girl Line and you could really get creative. Here is a close up of my own flower bunches made by layering the flower stickers with some punched out flowers from the Love patterend paper. I used scrappers floss as my stems to finish them off. 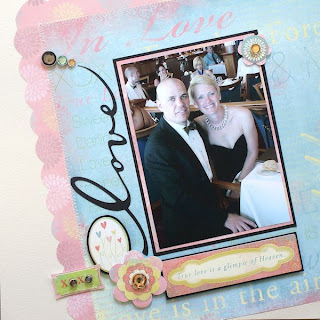 For some additional projects using the Love collection, please visit Alice Golden's and Jen Gallacher's blog. And while I welcome and enjoy comments on my blog, in order to enter today's contest you need to make sure you leave a comment on Wendy Inman's blog by 11:59pm MST on Sunday, January 18. See you tomorrow to share some more samples from yet another theme! BTW...I will be doing the contest tomorrow. So, make sure to stop by. The colors are so soft. Great job, MF! OMGOSH MF. I LOVE the lo of you and Gregg dressed to the 9's, the lo of Ace is SO SWEET as is the "I ♥ U" one! these are awesome - as usual - I love how you paired the black with the papers for the layout of you and Gregg...and that photo of Ace is precious. 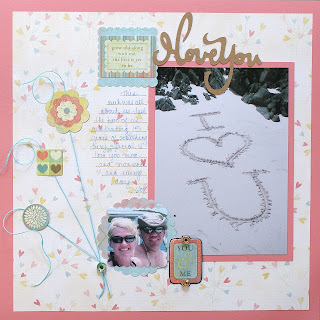 Super cute LO's...I 'heart' the snow I LOVE YOU pic...so sweet. Yumminess! I love these LOs and especially that photo of Ace. You and Gregg look awesome too. OMG! It's so soft, so nice! I want it!!! very nice! what a great job!